I have been loving, loving, loving, (did I say loving?) Walmart’s Grocery Pick-Up Service. You can read here about why I initially tried the service. We’ve used the online ordering feature and pick-up option about half a dozen times now. Just last week I mentioned here on Instagram how I had planned to run into Aldi for a quick one-week grocery haul for October. But after much real life transpired (hello, van full of tired kids after an afternoon of Kayaking at the lake) I just ordered a combo two-week grocery haul and fill-in haul on my phone, which my husband picked up the next day. 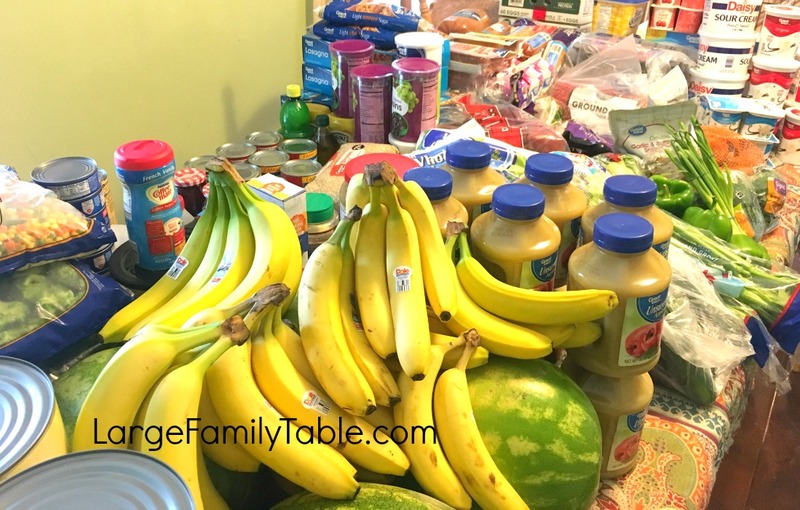 On August 28, 2017, I had also sent my hubby to Walmart to pick up a huge 4-6 week mega grocery haul. I stayed home and nursed the baby. 🙂 I explain in today’s new vlog that what I usually call a “once a month grocery shopping haul” can really stretch out to 5 or 6 weeks. I plan for four weeks, and that’s about all my large family mom planning brain can handle. 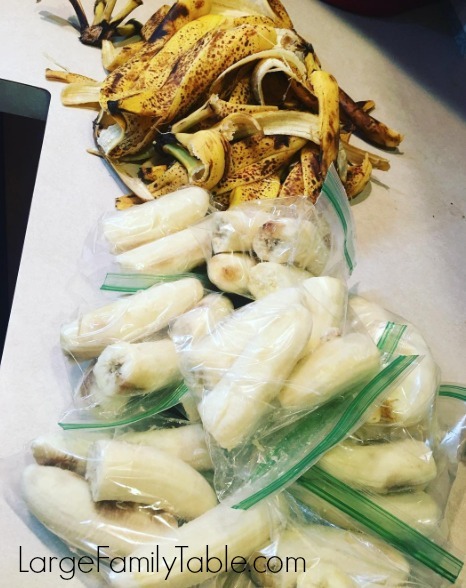 We work on more of a pantry challenge and cleaning out the freezer for a week or so as we’re able. Of course, we pick up a small fill-in haul for more fresh fruits, veggies, and milk within that. This large family grocery haul was for the end of August through Septemeber 2017. The grocery portion listed below came right in around $800. This haul included a ton of items for my Septemeber freezer cooking days (which the video is still not out for, but I’ll update here once it’s out). We filled in with a $200-ish haul, so that puts us around $1,000 for food. divided by nine family members (10 family member is nursing baby, so he doesn’t count yet 🙂 = $27.77 per family member a week. I don’t even break items down for past 4-weeks. By that point, we’re using things up and planning another massive haul. 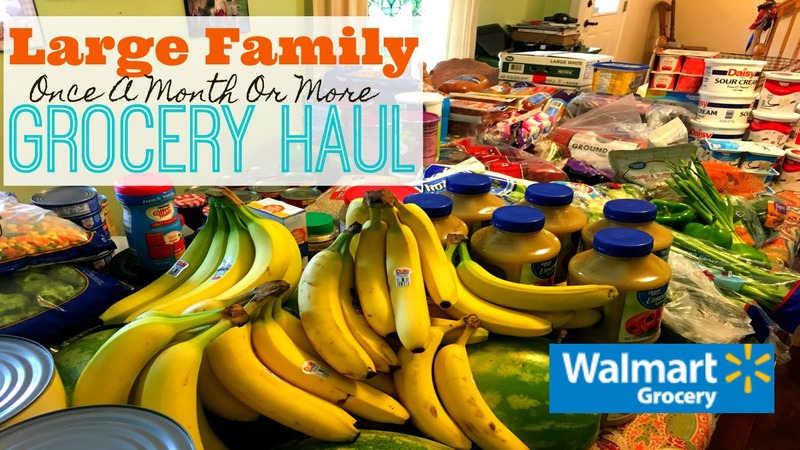 Here’s the latest Large Family Pantry, Refrigerators & Freezers Tour | Before & After Huge Grocery Haul if you’re interested where we keep all this stuff! As I also explain in today’s Large Family Grocery Haul video, Walmart will substitute items I’ve ordered if I choose that option. Most of the time the substitution is a name brand or better quality than what I originally ordered, only I get the off brand price. 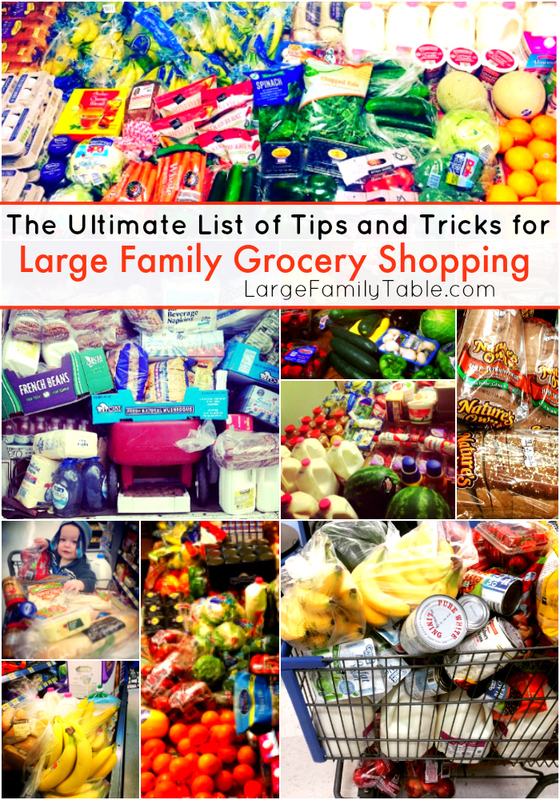 The Ultimate List of Tips and Tricks for Large Family Grocery Shopping Here’s a compiled a list of well over 50+ ultimate tips and tricks for large family grocery shopping from several moms of many. Here are over 100 Large Family Dinner Recipes to help you get dinner on the table! Love your you-tube videos. Please add me to e-mail list for recipes. I have been researching our Walmart Home Delivery in SC and the prices are not as good as the in-store pickup. Can you shed any light on why. Thanks!!! We don’t have home delivery in our area. Are the home delivery prices higher for the service of having it delivered to your home? Is there a home delivery fee as well? There is no home delivery fee it is free shipping if you meet a certain amount for your order. However it seems that the prices you can have delivered are higher than those when you pickup and also many of the items with better prices say for store pickup only.